It is hard to walk anywhere in the Helsinki area and not find a random object propped up in a way that it’s owner will find it. Each of these items inspires its own story and I often wonder how it got there and whether it will be found by whomever lost it. Throughout the winter months, these items mostly consist of random mittens and gloves positioned on tree branches and other pointy objects along the various pathways for easy spotting. In summer, objects tend to be a bit more unusual—pacifiers, eye glasses and sun glasses, umbrellas, etc—and harder to spot. But, not this wonderfully bright and cheerful guy. Yesterday, as we made our way through an eerily deserted city centre, we spied this random rabbit. Propped up on the door handle of one of the many closed-up and empty stores, he looked rather cheerful and oddly protective. In some ways, it was as if he completely belonged there. Who knows if he belongs to someone attached to the store. 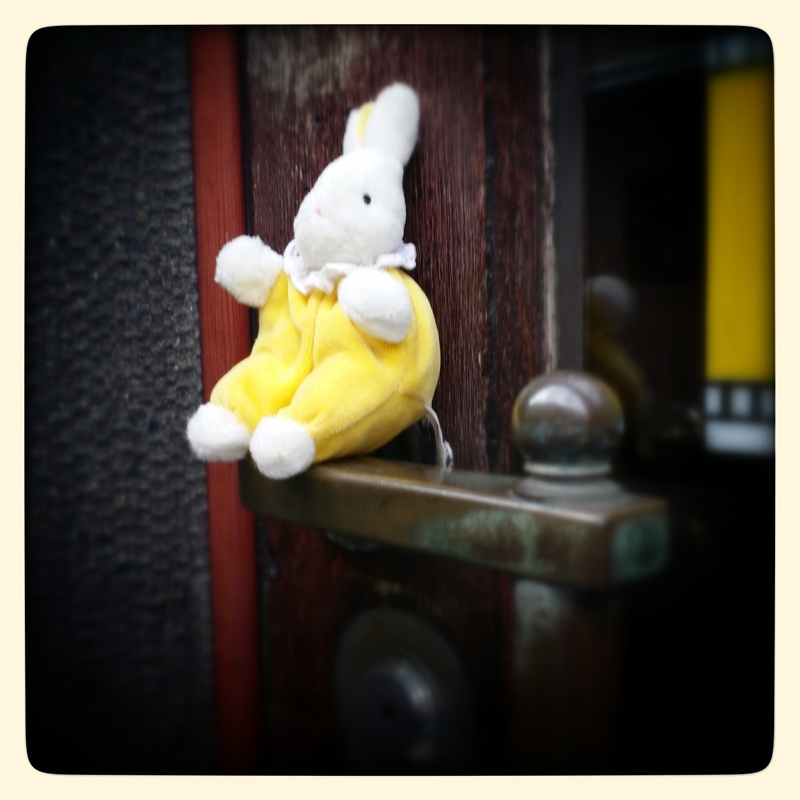 Most likely, some child chucked him from their stroller and will be gutted to have lost his/her beloved bunnie. Perhaps, later that evening, the frazzled parent of the distraught child retraced their steps and delightfully found him. Child will be happy and consoled and parents will be relieved. I hope this was the case, for the sake of both the parent and the child, as well as for the bunnie. If not, here’s hoping that this lovely creature remained protected in his little doorway, and eventually finds his way back to his family and home. Should he be adopted by another family, may they all be even more delighted than those who lost him. I’d love it even more if next time I’m in that neighbourhood, he’s still sat there, silently, cheerfully and brightly watching the world pass him by. Wouldn’t that be something?